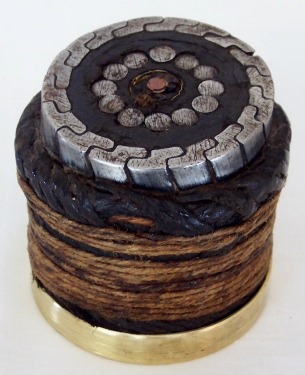 Piece of submarine cable with outer sheathing using the “Locked –Coil” system.The core is about 1/8 of an inch in diameter surrounded by 4 copper tapes and has anti teredo brass tape. The overall diameter is about 1-25/32 inches. Many thanks to Dr. Jenny Lee of the “Porthcurno Telegraph Museum” and to Bill Burns of the “Atlantic Page” for providing additional information.